Led by six globally-recognised experts in cancer care, the organisation known as CHILL, Cancer-related Hair Loss, International Leadership and Linkage, announced today an initiative to collect and track evidence-based patient information and clinical guidance. Data will be used to establish clinical best practices to ensure maximum effectiveness of scalp cooling to minimise chemotherapy-induced hair loss. A new website, scalpcooling.org will serve as a global hub for patients and care providers seeking information about hair loss and scalp cooling, as well as a decision aid with data from the CHILL registry showing chances of hair loss with and without scalp cooling. With an estimated 14.1 million patients diagnosed with cancer worldwide in 2012 (according to World Cancer Research Fund International), cancer is a significant global health issue affecting every region and socioeconomic group. The CHILL Registry strives to become a platform that allows clinicians to understand cancer-related hair loss during leading edge cancer therapies, improve supportive care by comparing their own data with international estimates, and access the extensive resources of comprehensive cancer treatment teams around the world. CHILL has designed an online registry that makes communication and global research accessible to all health care professionals interested in using scalp cooling with their chemotherapy patients. The registry collects data about severity of hair loss of patients with and without scalp cooling. For patients undergoing treatment with scalp cooling, physicians can also gather information on tolerance and satisfaction with the results of treatment. Positive results from two separate multi-centre clinical trials on scalp cooling were published in February 2017 by The Journal of the American Medical Association (JAMA). 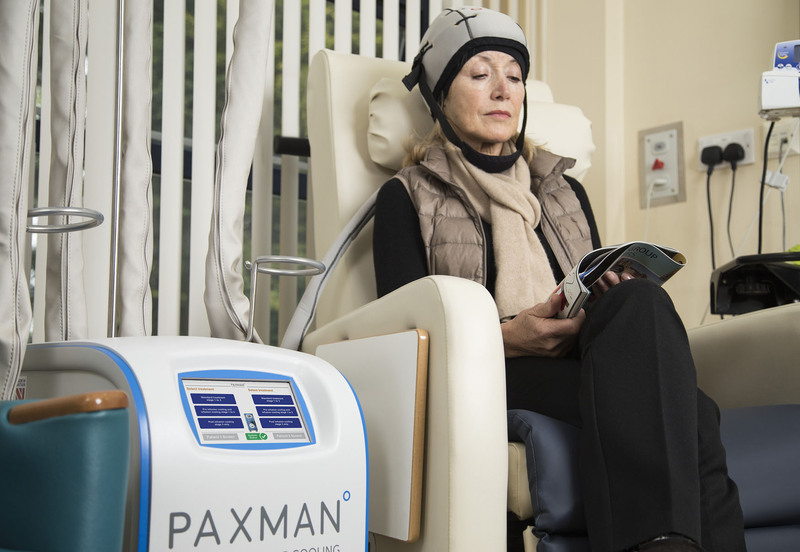 Both US tudies of breast cancer patients using the DigniCap and Paxman scalp cooling devices found that a majority of patients achieved favourable results from scalp cooling treatments to prevent hair loss. The scalp cooling medical device features a tight-fitting silicone cooling cap that is placed directly on the head, and an outer neoprene cap that insulates and secures the silicone cap. The cooling cap is connected to a cooling and control unit. A liquid coolant circulates throughout the silicone cap, delivering consistent and controlled cooling to all areas of the scalp. Once the cap is fitted to the head, the temperature of the scalp skin is significantly lowered, resulting in vasoconstriction with reduced delivery of chemotherapy to the scalp skin, as well as reduced cellular uptake of drugs due to decreased intra-follicular metabolic rate. Together, these factors minimise the hair loss that is a side effect of many chemotherapy agents. The CHILL Registry is funded by Dignitana, maker of The DigniCap® Scalp Cooling System and Paxman, maker of the Paxman Scalp Cooling System. Launched in 2016, CHILL, Cancer-related Hair Loss, International Leadership and Linkage, is a collaboration between cancer specialists in several countries to collect and share knowledge about the treatment and prevention of hair loss, a common side effect of chemotherapy as well as scalp-cooling treatment to address this side effect. CHILL maintains the website scalpcooling.org as well as a global registry to reflect the incidence of hair loss in daily clinical practise. This platform facilitates the exchange of information among patients, physicians, nurses and researchers.